When players enter an online casino or an online bingo room, they will immediately notice the many different variations of bingo that can be played. While some players will prefer traditional games, some great forms can be played that offer faster games and more ways to win. One of the newer types of bingo that has been introduced is 30 Ball Bingo. This game is also referred to as Speed Bingo due to its very fast pace. Those that are looking for another way to enjoy this great game will be thrilled with 30 Ball Bingo and the action it provides. The game varies from other bingo games in that players can only win by getting a coverall, but with just 30 balls in play, this is not a difficult feat. Bingo fans around the world have been enjoying the endless action of this game, and it can be found at leading bingo sites catering to global players. The game can be played in a free version, which is an excellent way to learn the rules and become comfortable with the game before purchasing real money cards. Unlike many other variations of bingo, when playing 30 Ball Bingo, there are no varieties of patterns to complete. The only winner will be the one to complete a Full House on a card. Many online sites are now offering 30 Ball Bingo as a three-stage pattern game, where players will start by getting a single line, then two complete lines finally leading to the coverall. The excitement begins by purchasing bingo cards, which are sold for varying amounts to accommodate different budgets. When the game starts, up to 30 numbers will be called out, and as soon as players complete the full house, they click Bingo to claim the win. The game is quite easy to play, though it does move quickly, which is why most sites will also offer an auto-daub feature to ensure that no called numbers are ever missed. The simplicity of the game and the card layout make 30 Ball Bingo an easy game to pick up, even for those that have never played bingo in the past. Just complete the card and mark off all nine numbers to be a winner! Many new players have found that 30 Ball Bingo offers more excitement than other variations and since the game moves quickly, players can get in more games in a shorter amount of time. While there are many versions of the game, many players prefer this option over more traditional bingo games. 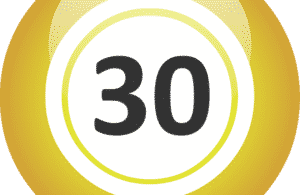 When playing 30 Ball Bingo, some benefits make this game stand out over others that are found online. Faster Pace – With fewer balls in play, the game moves very quickly, consistently producing winning cards frequently. Players believe they win on a regular basis when selecting this version of the game. Constant Involvement – Seeing as just 30 balls are in play, players are always involved and are marking off squares, especially when they are playing multiple cards. Easy to Play – Instead of watching for specific patterns, players just need to cover all 9 squares to win. As with all bingo games online, players can purchase multiple cards, which is the best way to enjoy payouts. The cards are also offered for various amounts, so players with low, medium or high budgets can easily enjoy the game and always maintain that budget with ease.